If you want to experience Milan by bike but haven’t got one, then Bikemi is perfect for you. 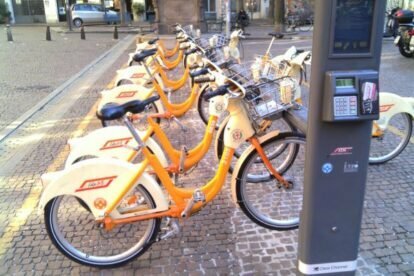 In the centre of Milan there are lots of Bikemi stations, where you can rent a yellow bike not only for a long period, but also for a week or a day. The red bikes are electic bikes, which would be very useful in case of hills, if there were any in Milan. Or for very hot days, that justify being too lazy to move your legs ;-). You only need a credit card (pre-paid cards are not accepted) and then you can register either via mobile, internet or phone, by calling the number 0248607607. An app is now available. If you are in Duomo, Cardorna, Loreto, Centrale FS or Garibaldi you can head to the ATM point inside the tube station and fill in the registration form there. This service is € 4.50 per day, 9 per week. The first 30 minutes of use are free (25 cents for red bikes), each additional 30 minutes slot costs 50 cents. I love to bike in Milan, especially in the parks, but since the traffic is so heavy (and the drivers so crazy) I suggest to start using your bike on a Sunday, when the city is completely empty: people from Milan tend to spend the weekend either in the mountains or at the see. Then when you are familiar with bike paths and Italian drivers, you’ll be ready to bike all over the world.